Just as important as the depth of your lie in the rough is the direction in which the grass is growing. When the blades of grass lean toward your target, it's usually a big advantage. More often than not, this type of lie is what might be called a superflyer. 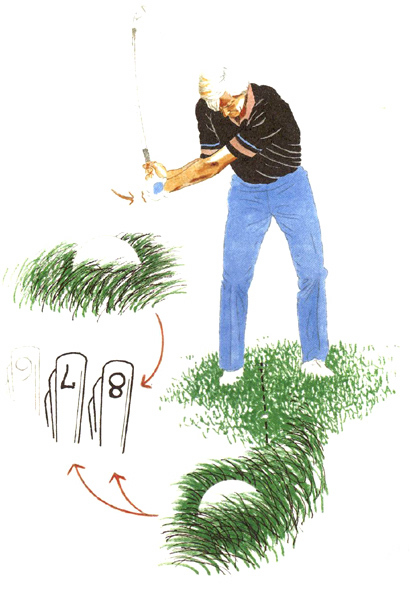 The grass at the back of the ball won't impede your club much, and the ball will jump quickly out of its nest. With such a lie, you're wise to take two clubs less than usual. When the grass is growing against you, you have a bigger problem. Generally speaking, you'll have to take less club from this lie as well, but as a matter of survival. You'll have to hit the ball with extra force if you hope to get good distance, and in the worst of lies you'll have to cut your losses and simply wedge back to the fairway. Whenever you're playing against the grain of the rough, be sure to position the ball well back in your stance, to facilitate the necessary downward chop. Also, keep a firm grip on the club with the last three fingers of your left hand, so that the blades of grass don't twist the clubface out of alignment at impact.